Syracuse University officials have taken the wraps off a proposal to replace the Carrier Dome with a similarly sized stadium topped with a retractable roof. University officials released their letter to Syracuse Mayor Stephanie Miner on Saturday proposing construction of a 44,000-seat building at a cost of $495 million, The Post-Standard reported. The stadium would be built on private property near the main campus and is envisioned as part of a complex with a 250-room hotel, 160 apartments and 150,000 feet of retail space. The school owns the Carrier Dome but would be a tenant of the proposed new stadium, which would be built with a combination of private and taxpayer dollars, the letter says. It is not clear what would happen to the Carrier Dome if the new stadium is built. Rumors of a replacement for the Carrier Dome, a 49,000-seat building opened in 1980 as the home for the school’s football team, surfaced last month. The plan reportedly has the support of New York Gov. Andrew Cuomo and Onondaga County officials, but Minor recently went public with concerns about potential costs to the city. Saturday’s letter responds to Miner’s Jan. 10 letter to school Chancellor Kent Syverud asking questions about the project and reassured the mayor the plan does not require funding by the city, the newspaper reported. The Carrier Dome is the largest domed stadium on a U.S. college campus and has been the largest on-campus basketball arena since the school moved its games there in the early 1980s. 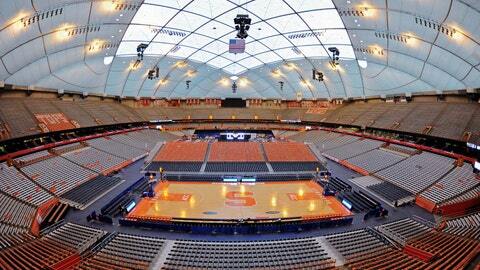 It was built at a cost of about $27 million and has frequently housed crowds of more than 33,000 fans for basketball.